Re: Carb woes. Any advice? That fuel looks terrible. Maybe just the camera? Yeah its yellow. Amazing thing is that I just filled the tank last week. That gas sits for maybe 2 days at most. On another note, i'm going to have to drill two more holes in the pump linkage because the other side works but doesn't engage until wot. That's a problem. Why is there so much throw in the pump? accel pump plunger. Yours appears to be needing help. ALSO many of the 61 carbs use a shorter arm, typically the arm on yours started in 62. NOTE: use of words such as 'many' and 'typically'. > arm, typically the arm on yours started in 62. > NOTE: use of words such as 'many' and 'typically'. Interesting. What do you advise to take up the slack, a second hole in the linkage? Btw, the fuel itself isn't yellow. The carbs are coated in some sort of gold coating and that's making everything look yellow. Is this the same carb that is now giving trouble? 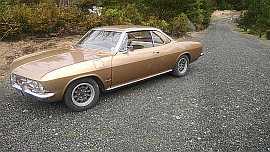 Get a Corvair Service manual. Read it. Forget the shade-tree, hillbilly fix until you understand what the problem is. > Is this the same carb that is now giving trouble? 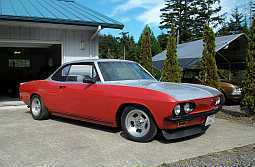 > Get a Corvair Service manual. Read it. I have a service manual. There is nothing in it that i have seen that explains why the accelerator pump would have excessive throw. No this is the "good" carb. The one that had a bad float works well, but again the pump on that one doesn't kick in until almost WOT. Both of these pumps are the same age assuming the carb shop replaced them. Thoughts? Maybe the left carb was sucking all the ethanol. It occurs to me that the new carb kits that I got, even though are only good for 1 carb each, come with 2 body gaskets. It also occurs to me that they only come with one pump and one seat/needle. Interesting that my left carb has that abomination of a pump and what looks like a much older needle seat than the right. Professional shop using one kit for 2 carbs? Possibly. > they only come with one pump and one seat/needle. > kit for 2 carbs? Possibly. Needle / seats can be slightly different - across the various carb kits (and across the past 50 years). I only use one brand of kit so I am not familiar with any potential differences. There may be no differences at this time as I do not know how many individual parts suppliers now exist. They have been buying each other out. The gaskets are for the two different carbs - primary and secondary (65 - 69), I think. One kit does one of either carb. Maybe the second gasket works on EM primaries, also, but I have never had an EM carb. You need to compare the gasket to the diagram in your shop manual to use the correct one for your primary carbs. 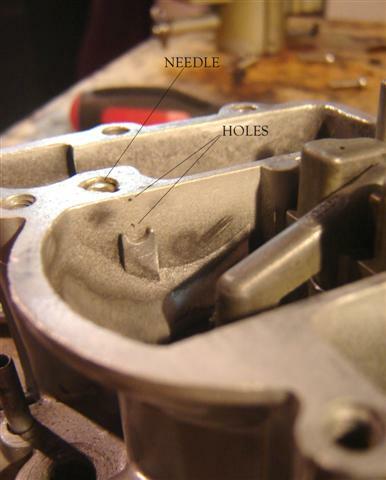 There is probably an extra hole in the primary gasket for the Power Enrichment Valve (65 - 66 primary carbs) compared to your EM carb, but there is metal on both sides of that hole in the gasket on the EM carb. Might be a good idea to get Bob Helt's Rochester Carb book if you do not already have it. The accelerator pump links should match - same length / same bend. I have no clue which link is correct for EM carbs. The linkage travel should match. You might want to check that the arm on the throttle shaft is not loose. They are "swedged" on and can come loose after decades of use. And, check that the arms match position wise - carb vs carb. As Steve Goodman stated, the accelerator pump lever should freely move and return. The accelerator pump link in the video is straight (and does not look long enough). I think it should be curved, but I am not familiar with EM carbs. The link also looks to be a thinner diameter than a stock link. I think your local shop tossed together a couple carbs with available pieces. I do not think that they really know Corvair carbs. Personally, I would ship the carbs to a vendor here (Steve Goodman; Ken Hand or any other vendor that is the closest to you). They should be able to put together a matched pair of carbs for you. Otherwise, you need Bob Helt's book and slowly go through your carbs (every piece) to determine what you have. If you live near a Corvair CORSA chapter, you can get in touch with them and there should be someone who can figure what you have. Years ago, I had a couple new seats from kits where the needle mating surface was deformed / malformed (worn tooling?). I threw them away. Edited 1 time(s). Last edit at 08/07/2018 01:03AM by RobertC. The thing is I gave them two complete carbs off of the car. It ran, just not well. So why would they mash up parts? The linkage sits snugly in the arm. I reassembled one carb last night with the new parts and it is smooth. Hopefully this gets it running normal. So... I haven't driven it yet but I found the problem. Both little holes above the pump valve were 100% clogged. After I put everything back it still didn't work, so I took it apart again and used a frayed motorcycle brake cable to run through the holes. After a bit of forcing some brown stuff shot out and now I have a fully working accelerator pump. I suspect this is why the pump looked so bad, fuel wasn't circulating through that area and just became varnish. The two we know about and are part of a carb clean...are these. Edited 1 time(s). Last edit at 08/07/2018 10:19PM by MattNall. My computer was in the shop for 4 days so I haven't been following. Something you said earlier jumped out at me, that is pinging on a 80 HP with 93 octane gas. 80 HP Corvairs usually run just fine on 87 octane or whatever is cheap, although the cheap stuff doesn't store well for more than a few weeks. Some low HP Corvair distributors only start out in the 6 degrees BTDC neighborhood rather than the more common 14 degrees or so. The extra 8 degrees can be especially apparent on the top end, going to 44 degrees instead of 36. I may be way off base here but thought I'd mention it. I'm glad you found the trouble with the AP holes and will be watching to see if you get it running better. I certainly have more than enough trouble with Rochester HV carburetors and read all I can find. Yup, those were plugged shut. Runs much better now! No more pinging either. Drove it to work today. Is it just terminology that made this difficult? > Is it just terminology that made this difficult? Well, like i originally wrote, it idled and ran ok, but it had a terrible and unpredictable bog under hard acceleration. The pinging under load came and went, but today, even in the heat, there was no noise. Interesting... doesn't make sense... but if it runs fine.... it's FINE! drive on..
> runs fine.... it's FINE! drive on..
lol I intend to do just that. The passing situation ping could be from fuel starvation couldn't it? Now you have me worried. I mean I also re-set all the float height and drop. The right side carb was well enough off that i could imagine some starvation.